Please uninstall the old version before installing the new one. A small skin that was specially made to be placed over the taskbar (make sure the taskbar is not set on top of windows and that windows media player is set to always on top) but will look good anywhere else as well. 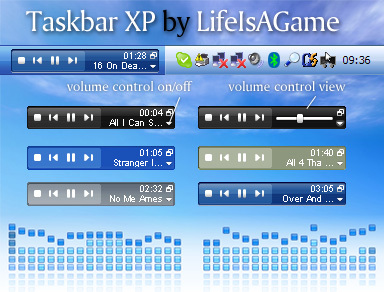 Zip includes 5 different skins matching the official XP themes. OK CLEAN UP THE CODE!! View id="View0" Title="Windows Media Player" backgroundImage="View0.bmp" titleBar="False" resizable="True" width="451" height="182" transparencyColor="#FF00FF" clippingColor="#FF00FF" scriptFile="actions.js;res://wmploc.dll/RT_Text/#132;" onClose="JScript:OnViewClose('View0');" onLoad="JScript:OnViewLoad('View0');"